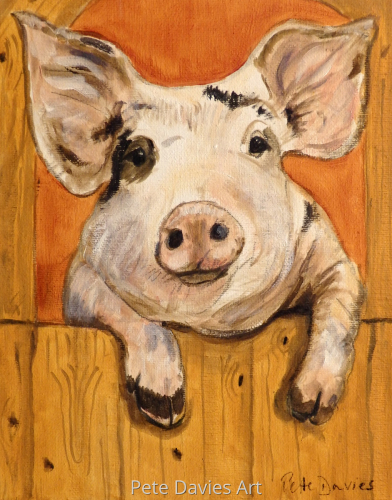 Original oil paintings drawings and prints. 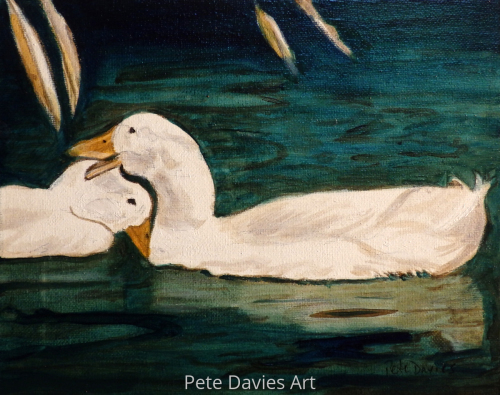 My favourite animal painting of two ducks on a pond reminds me of a happier time in my life. 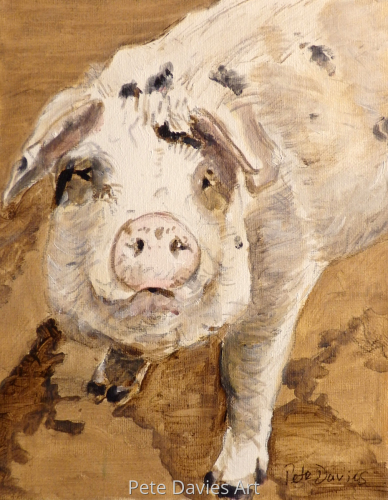 8" x 10"13" x 16.5"15.25" x 19.25"
9" x 7"14.25" x 11"16.75" x 13"
This Gloucester Black Spot Pig that I felt was offering to show me around its house. 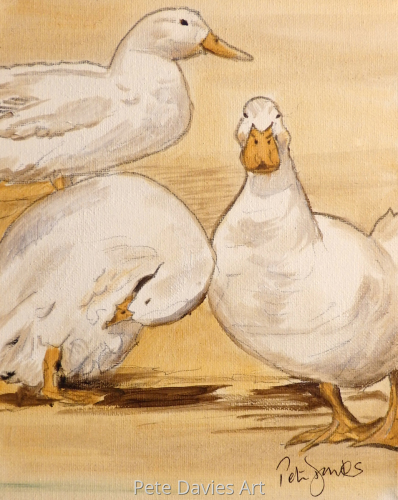 10" x 8"14" x 11"16.5" x 13"19.75" x 15.5"
A duck get together in a farmyard in Gloucestershire. 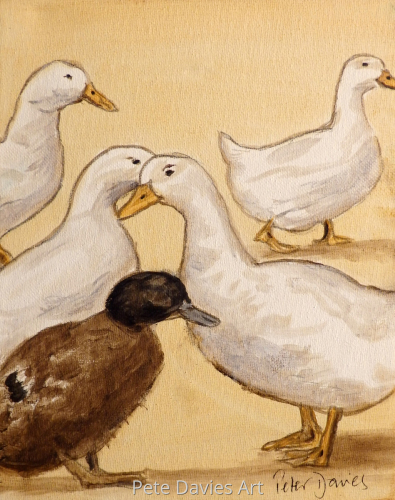 11.25" x 9"14" x 11"16.5" x 13"
Three ducks in a farmyard, one's watching me while the other is tidying its feathers. 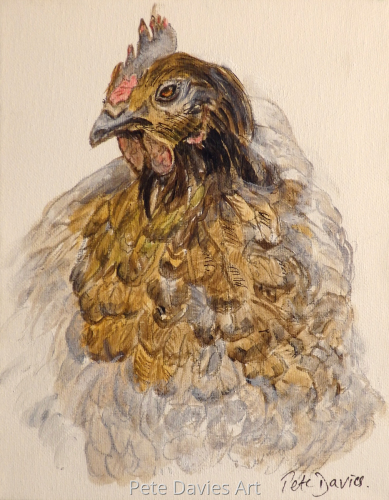 11.25" x 9"16.25" x 13"18.5" x 14.75"
Something about this chicken reminded me of the 70s singer, Adam Ant, hence the title. 'A very grandiose chicken, I'd say!" 9" x 7"14" x 11"18.25" x 14.25"
A very well dressed and noble chicken about to take a step forward. 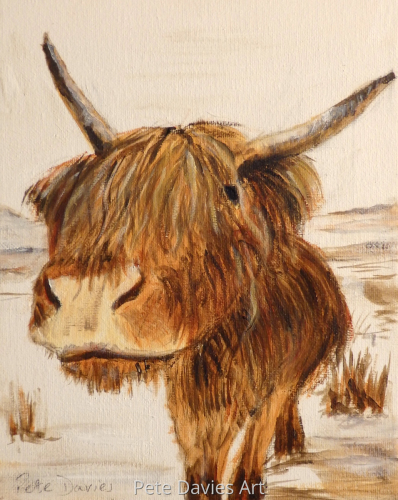 10" x 8"13.75" x 11"19.75" x 15.75"
Well this distinguished animal is a Highland cow, one of the oldest and bet known breeds to inhabit the West of Scotland. 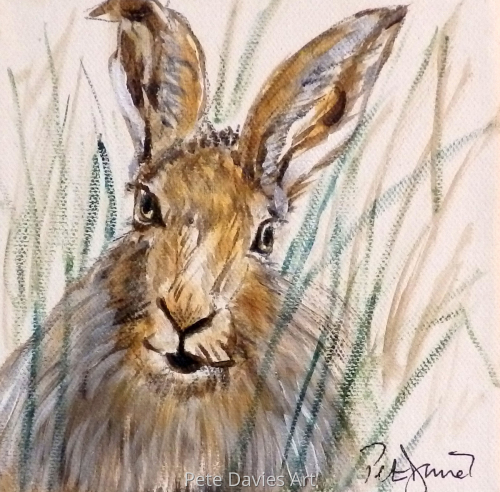 11.25" x 9"16.25" x 13"17.75" x 14.25"
A hare peeping from the grass. Hares can run up to 45 miles an hour, apparently at a Christmas feast of Henry III, 500 were eaten. It's not surprising they run fast! 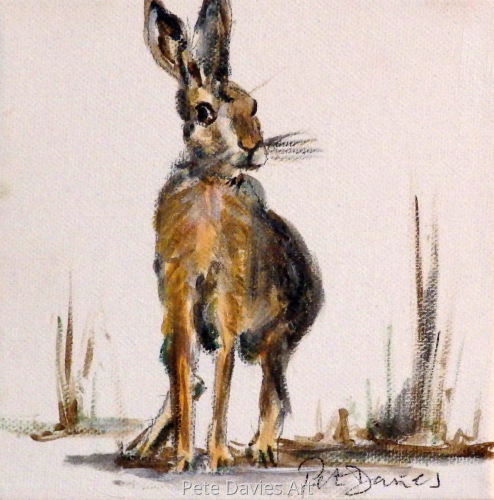 9" x 9.25"10.25" x 10.5"
A hare sits on a patch of bare earth about to head off at up to 45 miles an hour! Did you know a male hare is called a Jack and a female hare is called a Jill. In America they are called Jackrabbits. Well I never! 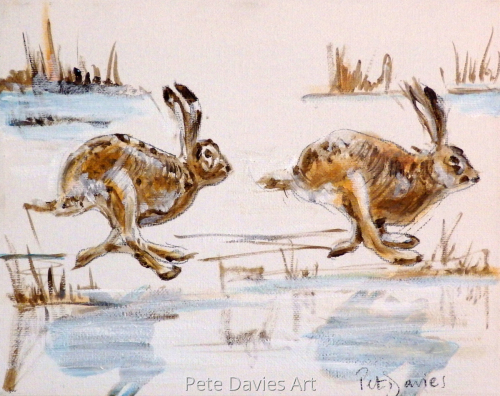 9" x 9"10.5" x 10.5"
Two hares chasing each other with their reflections in blue, shining beneath them. 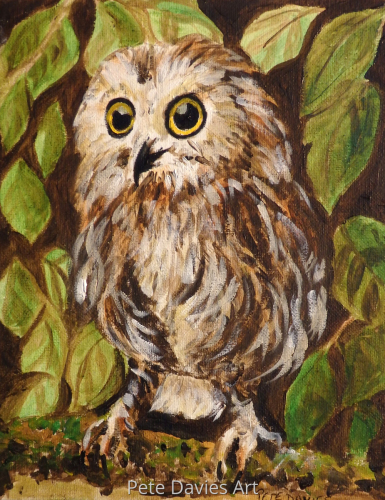 9" x 11.25"13" x 16.5"14" x 17.5"
The owl is a symbol of wisdom and represented Athene in ancient Greek mythology. In the North of England it is considered good luck to see an owl. 11.75" x 9"16.75" x 13"
A cold but thoughtful chick. 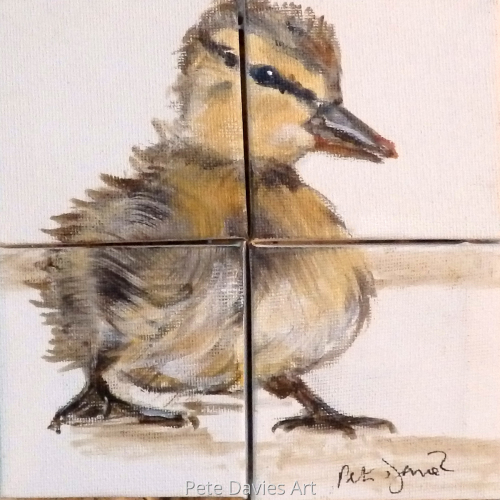 The oil painting is on 4 separate tiny canvases which when put together make the chick. 9" x 9"9.5" x 9.5"
A perky, happy, chick ventures forth, showing no fear! 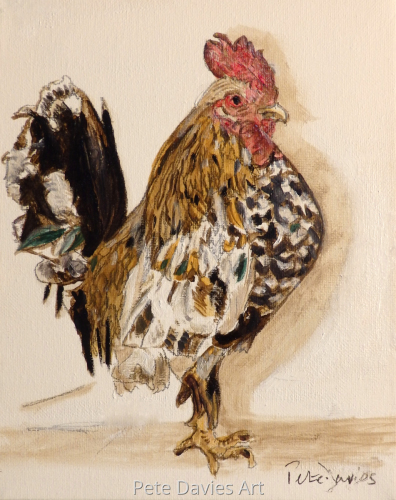 The oil painting is on 4 separate tiny canvases which when put together make the chick. 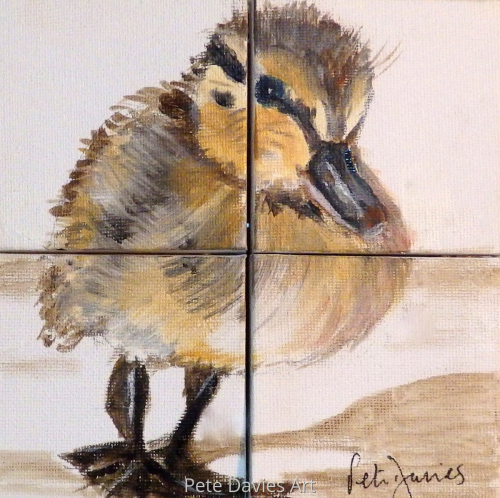 9" x 9"9.75" x 9.75"
A self contained, attentive duckling watches from the side line. 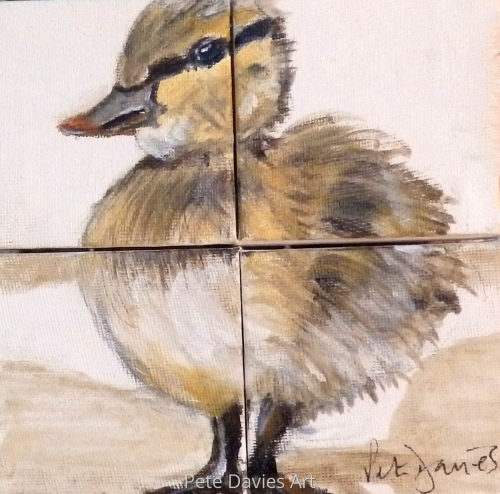 The oil painting is on 4 separate tiny canvases which when put together make the chick.